California is ‘blessed’ with tons and tons of propositions that are on the upcoming November ballot besides the usual election craziness. In this article, I cover my way of quickly sorting through the propositions and the way best to vote for me. The usual disclaimers apply. This is my approach based on a bit of cynicism and a bit of practicality. I hope you find it useful. For the past few months, my mailbox has been inundated with oversized postcards that yell in my face “VOTE YES FOR PROPOSITION 314” followed immediately by another postcard with a “VOTE NO FOR PROPOSITION 314”. All of these commercials try to take advantage of basic human biases (such as “don’t tell me what to do,” and “I know how to manage money better than the politicians,” etc…). 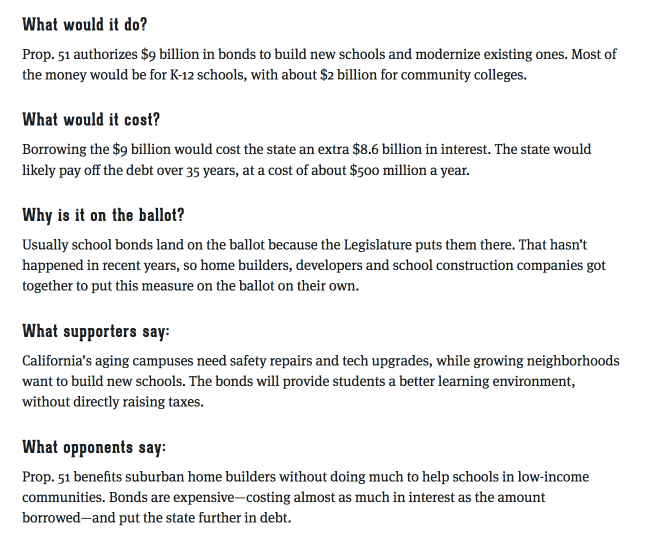 The one commonality across all of these propositions is the money that backs them up. My rather simplistic theory is to follow the money. If I like the funders of the ‘yes’ side of a proposition (and by like – I mean that the funder(s) are aligned with my values or at least some of my values), then I vote ‘yes.’ If I’m more in line with ‘no’ side – then it’s a ‘no.’ The approach is simple but the key question is where to get the data in a form that makes it clear and quick to understand a proposition’s goal and its backers. My first stop is my favorite search engine Duckduckgo (I know – a ridiculous name for an amazing resource). www.followthemoney.org is a beautiful site. While California is part of the site, this resource is targeted at a more national level. 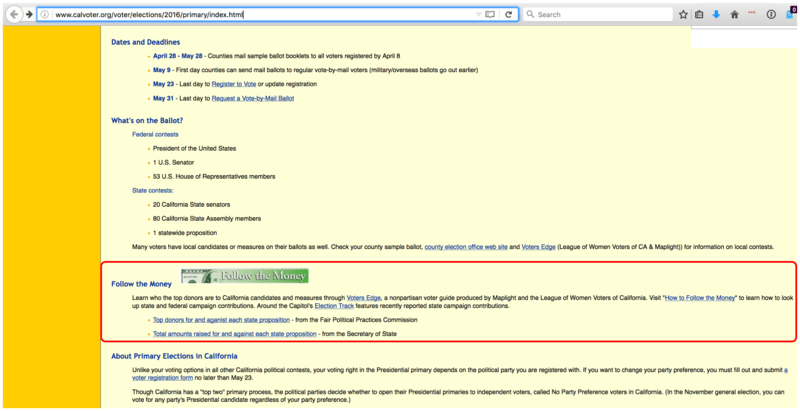 The calvoter.org site slaps you awake with a bright yellow coloration while providing some pragmatic information. Scrolling down a bit leads you to a “follow the money” section. 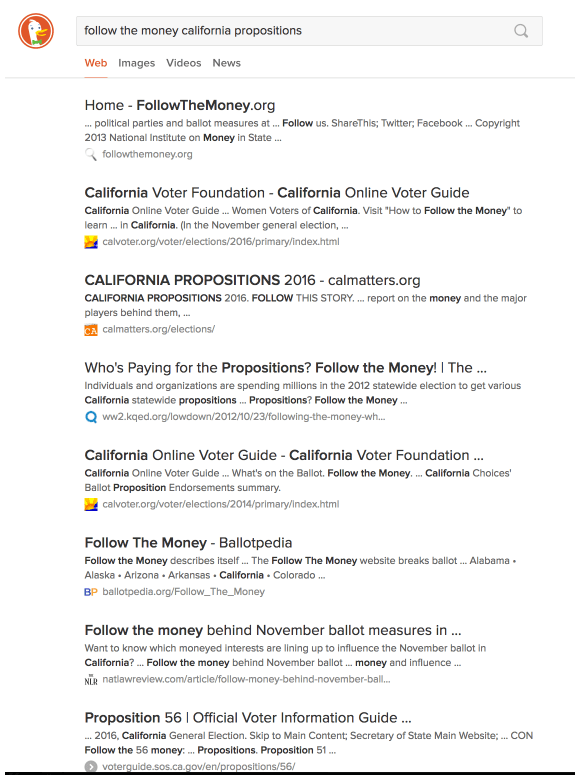 The ‘top donors‘ and ‘total amounts‘ links seem promising and lead to official state of California pages with money information. The problem is that those state pages don’t give much context beyond the numbers. These links are useful for more details about proposition backers/opponents and I use them after getting some context for a proposition (see below). The third time may be the charm in this case with the calmatters.org. 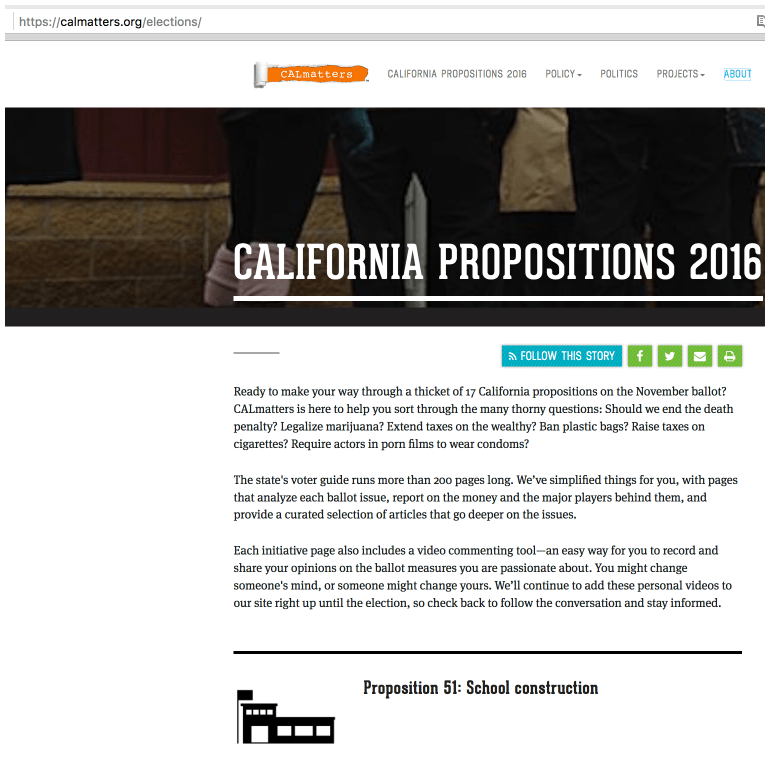 The site is a nonprofit and nonpartisan site that hits the key issues of each proposition. See the ‘Example Walkthrough’ (below) for how I use it. 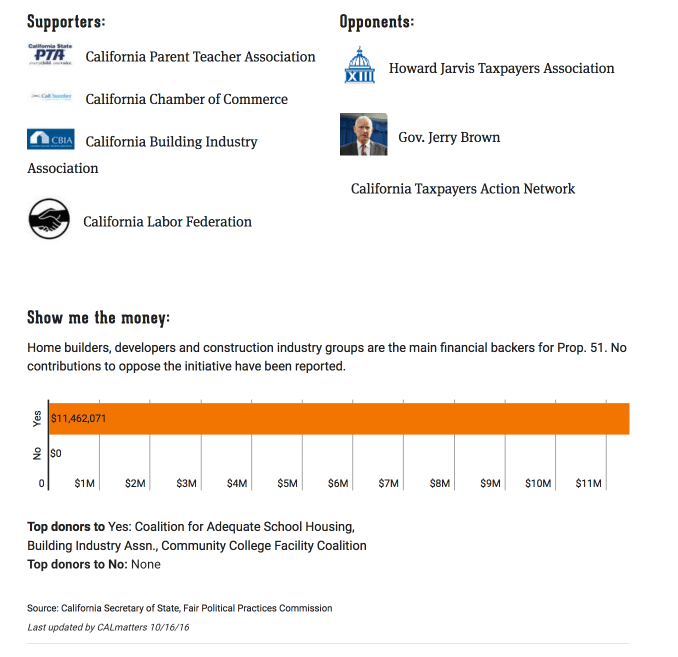 In this section, I learn about Proposition 51 through the calmatters.org and top donors sites and make my voting choice accordingly. My first impression is that it sounds good. What could be bad about “school constructions”? I have a child, and I want schools to be constructed and/or refurbished. Thinking: Yep – I definitely want this! 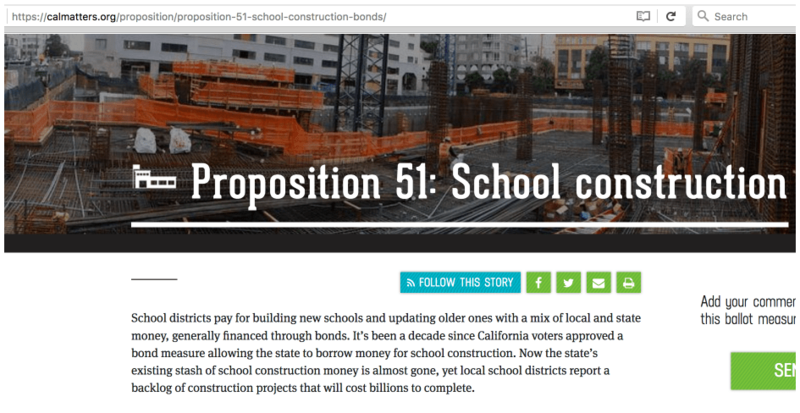 Continuing on https://calmatters.org/proposition/proposition-51-school-construction-bonds/ – there’s a good summary of what Prop 51 is about. Interesting – 9 billion dollars in bonds and almost 9 billion dollars in interest. Interesting sets of supporters and opponents. Eleven million dollars have been spent on this by the supporters though the chart doesn’t tell us who (we’ll come back to that through the top donor sites). Ummm…I like Jerry Brown for the most part – why is he against this? 4. The “More information” section links out to supporters and opponents. 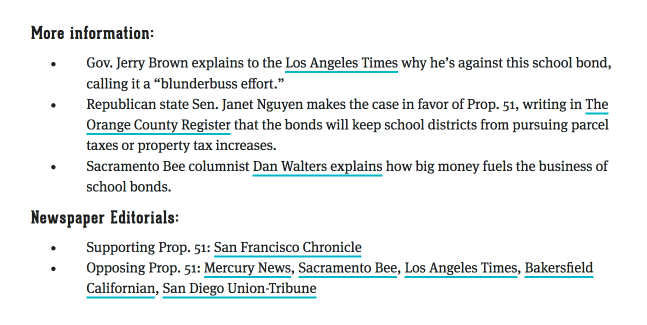 This is a nice section that links to various sites for both the proponents and opponents of Proposition 51. 5. Why is Jerry Brown against it? 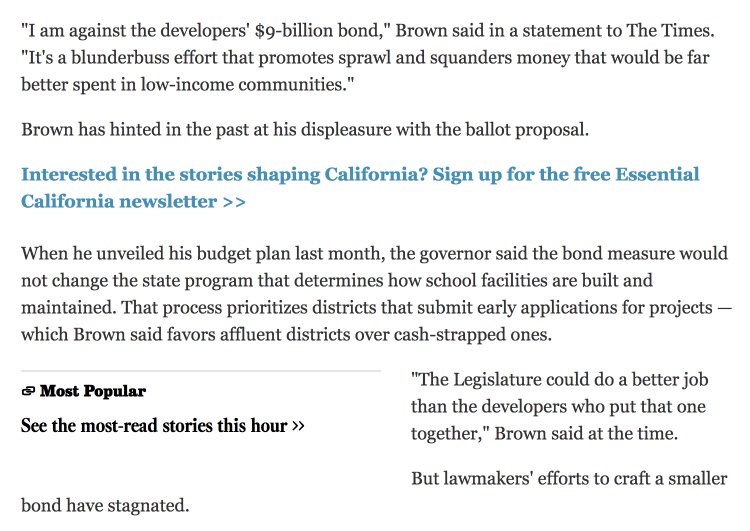 Following the Los Angeles Times link (http://www.latimes.com/local/education/la-me-pol-sac-jerry-brown-school-bond-20160212-story.html) from the above step. Brown is saying that this effort will promote more building in affluent areas while providing less to low-income communities. At the same time – the legislature is practicing ‘stagnation’ when it comes to this issue. So the choice is: builder/developer motivated agenda to increase their revenues or stagnation via the legislature’s indecision and inaction 😦 . The top ten donor site has much more detail about actual donors. 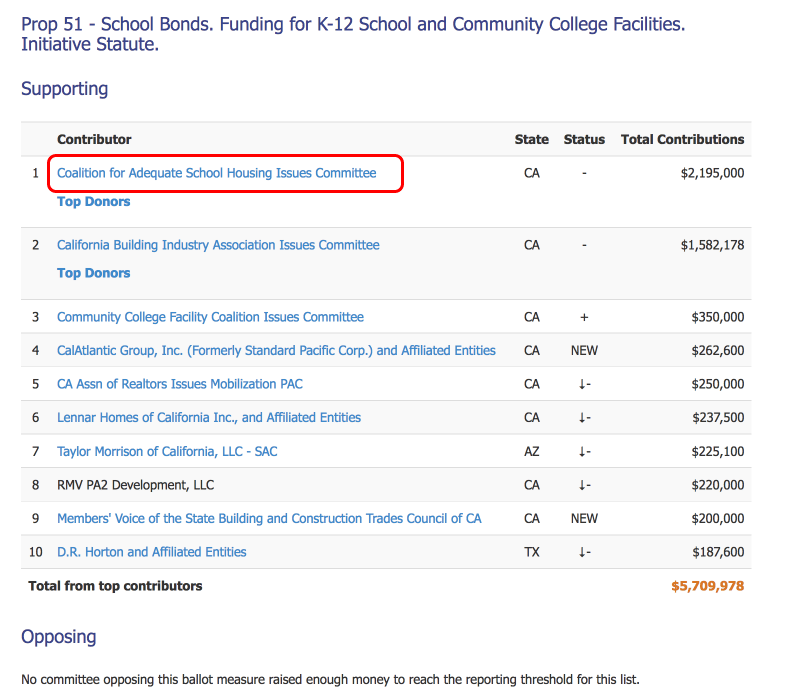 The highest donor is “Coalition for Adequate School Housing Issues Committee” followed by the building industry association. 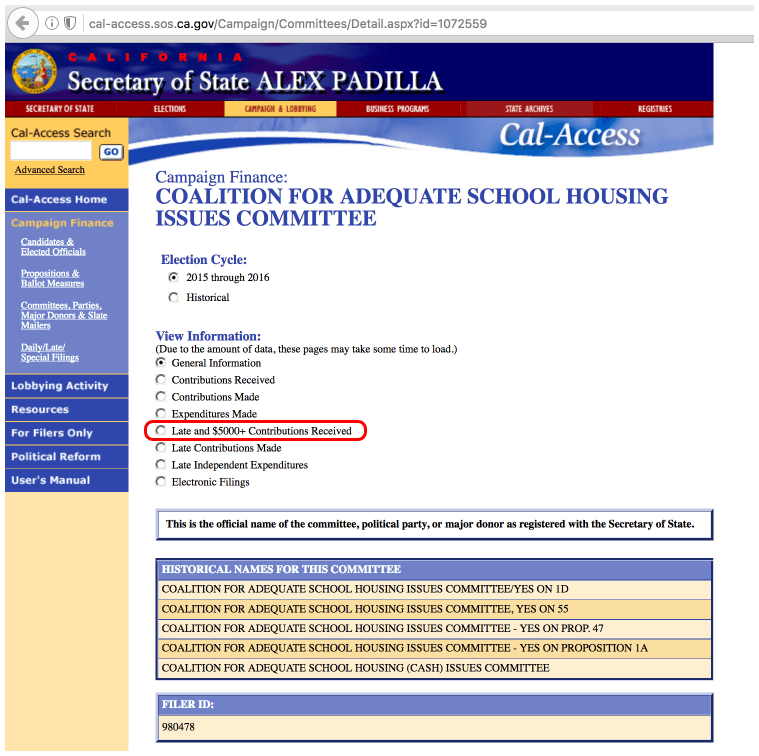 Who is this “Coalition for Adequate School Housing Issues Committee”? It’s a somewhat obscure name that just reinforces Prop 51’s topic – “School Housing” (i.e. school construction). 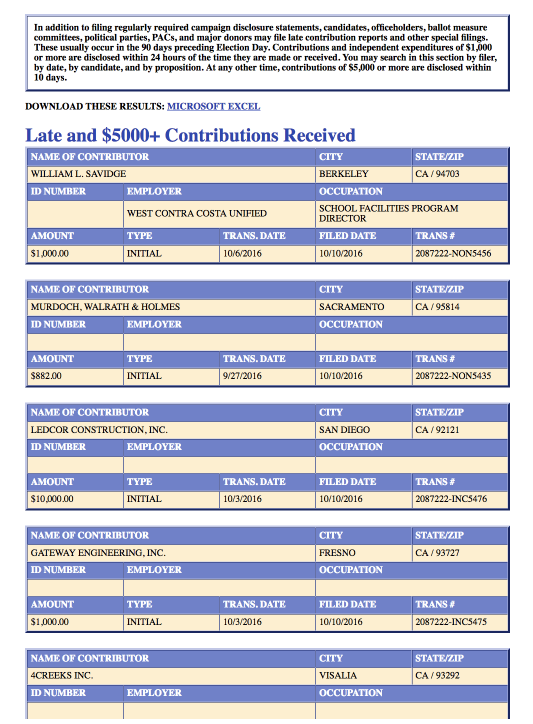 Clicking the link on this coalition leads us to more contribution details from the state’s site. Top level page of the state’s information about this coalition. The “Historical names for this committee” is also interesting. If I get minimal information from this page, then I can check out the propositions from the historical section to see the topics/issues that this organization supported. The “Late and $5000+ Contributions Received” option seems very interesting – let’s select that. I sure wish I could see only the $5000+ rather than the ‘late’ contributions. This would be easier to do through Excel but time is short and there are many more propositions to go through. There are some people in education that are contributing, and there are lots of construction, architecture, and property management firms. 9. How to vote on Prop 51? For the most part it seems like it is supported by companies that are associated with construction (like architecture firms, property management firms, etc..). Businesses don’t usually invest in something unless there is a significant upside. So there’s 9 billion dollars worth of upside for a 10 million dollar investment with the state paying 9 billion in interest (and by ‘state’ I mean the taxpayers of California). Do I trust these companies? Are they aligned with the communities in my area? Jerry Brown is against this proposition. He claims that it will help builders and take away from poor communities. This gives me significant pause. California is a state of sunshine and propositions. There are 15 more propositions to go beyond Prop 51 (sheesh). Mailers and TV commercials are useless when it comes to understanding propositions and are no different than car commercials (though I have to say that I like car commercials better). They tug on psychology and emotion to get the voter to react with a ‘yes’ or a ‘no’. I’ve tried to figure some rapid way to understand the issues, and I’ve written it in this post. Hopefully, it helps you. If you have any feedback or a better way to figure out California’s propositions – let me know via Twitter (@eli4d) or Snapchat (eli4dcom).